Simply take a dozen eggs, and break them, saving only half the egg whites. Beat them together. Take your ham, and prepare as necessary (chop / dice / etc). Mix it with your eggs. Then, take some lard, melt it, and throw it in your eggs, making sure not to overcook the mixture. Serve. The omelette lulls the novice cook into complacency. While it only requires a few ingredients, it demands skill, confidence, and timing to pull off with panache. One eggshell in the mix, an overly heated pan, or the unsuccessful flip, and the entire effort falls flat. Cooked to perfection, it represents the quintessence of modern French cuisine. It draws together fresh ingredients, developed for flavor. Simplicity and balance marry creamy texture and delicate, fluffy eggs. Ever curious archivists, we wondered where the omelette made an early impression. We’ll be honest; we were a little hungry that brainstorming day. While this seemingly humble dish has become a brunch and Tuesday evening staple in our repertoires, the hunt was on to find its initial publication in a historic cookbook. A bit of determined searching later, we found a likely early contender. 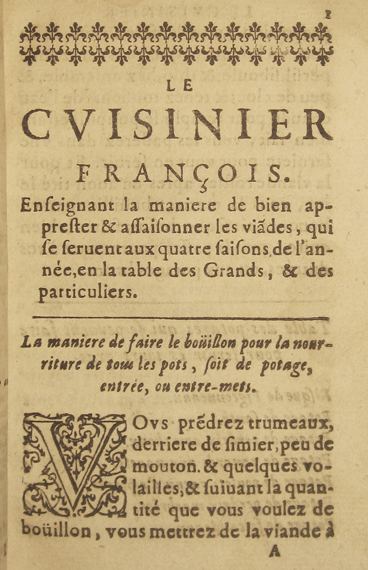 Le cuisinier françois… Paris: Chez Pierre David, 1652. 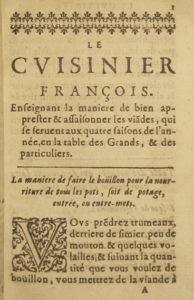 In his 1651 cookbook Le Cuisinier François (hereafter LCF), François Pierre de la Varenne helped transition France away from an Italian-style of cooking requiring expensive imported spices into its modern form. La Varenne was not solely responsible for altering the state of cooking, but he was the first to put these innovations in writing. LCF contains over eight-hundred recipes divided by courses, soups and broths, starters, second courses, and small dishes. The first recipe describes “La manière de faire le Böuillon pour la nourriture de tous les pots, soit de potage, entrée, ou entre-mets [the manner of making bouillons for stews, soups, main courses, and small dishes]…” Beginning with the basics—seasoning broth—La Varenne built upon foundations to introduce dishes like bisques and pottages. Instructing cooks to prepare locally-sourced ingredients in a recognizably “French-style” reinforced a sense of transferable cultural heritage connected to food. While the English and Italian cookbooks of its time offered primarily recipes more akin to potions or subsistence-level fare, this book emphasized the development of flavors in seasonal, taste-based dishes. Instead of tending toward preserves and the extension of foodstuff, La Varenne introduced foundational flavoring methods still in use today. La Varenne printed the earliest instructions for the roux, the béchamel sauce, and notably, the omelette. LCF presupposed readers understood proportions, could adapt ingredients when necessary, and could interpret directions like “heat” or “boil” to suit their “kitchen” environments. By prioritizing the combination of ingredients for flavor and texture, alongside instructions for presenting the dish in an appealing fashion, La Varenne established a new format for cookbooks. His legacy thus relies both on its place in the history of cooking in France and its status as printed object. La Varenne, a commoner, started cooking as an apprentice in a local kitchen, participating in the guild system as a cook and eventually rising to the rank of kitchen clerk for Louis Chalon du Blé, Marquis d’Uxelles (1619-1658). As kitchen clerk for the Marquis’s household, La Varenne was responsible for all food service. His rise to this status was exceptional, as the role of kitchen clerk was traditionally reserved for nobility. Dear Reader, in recompense all that I would ask of you is that my book be for you as pleasurable as it is useful. By encouraging utility and enjoyment, La Varenne made cooking more than just a necessity, but a skill that could be elevated to an experience in even a modest household. Cooking in medieval and early modern France had been largely a profession that relied upon oral transmission of secret knowledge through the guild system. Membership within the trade guild established apprenticeships and monitored job opportunities for individual cooks who worked in the large houses of the French aristocracy. For two centuries prior to La Varenne’s text, perhaps in part due to the control enforced by the guild system, French cuisine languished, with no new cookbooks coming to market. Both English and Italian cookbooks dominated. In placing acquired knowledge in a sustainable, replicable form in the printed book, LCF circumvented time-honored traditions of gaining information. By presenting professional secrets to an open marketplace, this text suggested cooking was within reach for whomever had the means to purchase the book. This quite naturally spurred controversy within the cooking community and sparked conversations about how much information should be shared. Despite the controversy—or perhaps because of the controversy—given England’s own rocky political situation in the 1650s, LCF was the first known cookbook translated from French in English in 1653. It remained a bestseller in both forms into the eighteenth century. Within the first 75 years, LCF had gone into 30 editions (Scully 11). Its ground-breaking translation, titled The Frenchy Cook, went into 61 editions before 1754. While moveable type dated back to Gutenberg’s printing press in the 1440s, the seventeenth century encouraged the spread of print culture as general costs went down. Texts like LCF could be more easily exchanged, copied, and even translated for travel across the channel, especially as cities such as Paris and Amsterdam served as printing hubs. 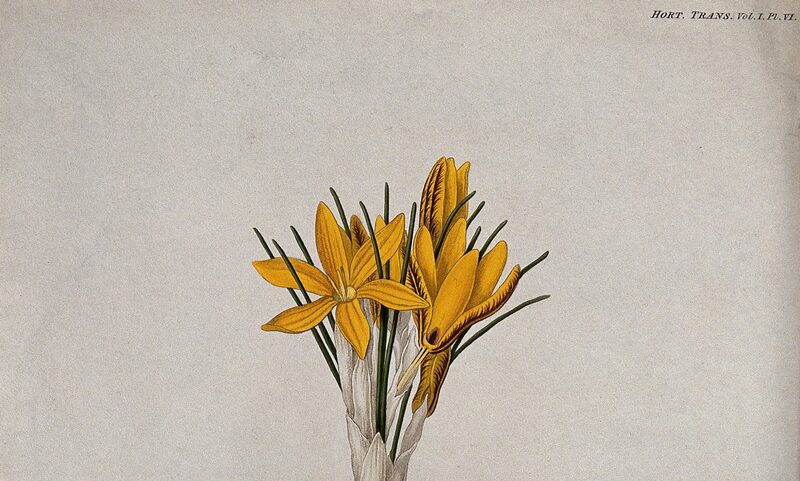 Polly Russell, curator at the British Library, explains that La Varenne’s cookbook was marketed to ‘every private family, even to the husband-man or labouring-man, wheresoever the English tongue is, or may be used.’ And the cookbook remained an international bestseller until the French Revolution! From an English translation of La Varenne: The French Cook (London, 1653), p. 95. La Varenne, François Pierre de, Le Cuisinier François (1651). La Varenne, François Pierre de, and Scully, Terence. La Varenne’s Cookery : the French Cook ; the French Pastry Chef ; the French Confectioner. Blackawton, Totnes, U.K., Prospect Books, 2006. Caroline B. Barta is a third-year PhD student in English Literature at the University of Texas Austin. Her work researches questions of literacy, access, gender, and cultural commodity. She received her Masters in English Literature from Boston College (2015), and her bachelors in Great Texts and Classics from Baylor University (2012). She considers recipes useful textual artifacts, revealing how women especially retrieved and shared practical literacy in their households and kitchens. Amy Vidor is a fourth-year doctoral candidate in Comparative Literature at the University of Texas at Austin. She completed her Bachelors’ degrees in English and French from the University of Southern California (2012) and her Master’s degree in History and Literature at Columbia University (2014). Her work analyzes how female testimony and textual inheritances complicate cultural memory. Her research areas include francophone and anglophone literature.